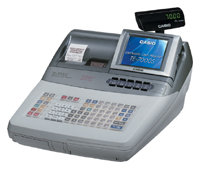 The Casio TE-7000S is a powerful solution for scanning applications. Such features as stock control,suspend and resume and a host of other features make it ideal for convenience stores, small to medium retail stores, liquor stores etc. The TE-7000S also features a large 14-line, 40 character display to provide at-a-glance readability and simple accurate register operation.